Upon watching this a few times after purchasing the DVD I was stuck not only by the excellent surround sound and picture quality but by the sophistication of the story and script. It’s possible to miss these the first time around given the amazing visual effects and action sequences. Repeated watching rewards the viewer with a deeper appreciation of what’s going on. 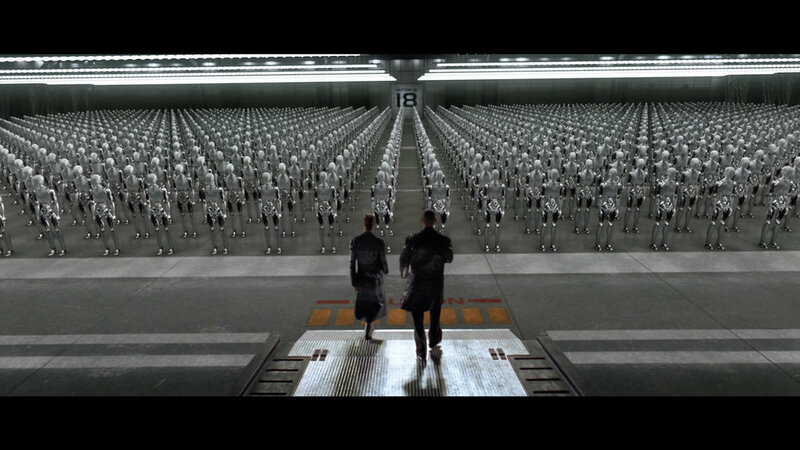 There’s an underlying theme about robotic evolution that is explicitly mentioned several timesin the movie — even shown — but which is easy to miss if you don’t pay close attention and think. You hear more about this in the audio commentary track and realize that some detail might have been lost due to the need to create a “summer popcorn” type of movie. Director Alex Proyas (Dark City, Knowing, Garage Days) mentions this several times in commenting about the challenges of working with a studio system that seems, in his mind, to be afraid that audiences will not be sophisticated enough to understand and appreciate what’s going on. The result is that certain themes in the movie are mentioned only in passing and are quickly lost. Watching the DVD, though, I was struck at how well the movie and the story are constructed. You do have to think, not just about the “murder mystery” but also about “what’s going on with the robots?” They are evolving. “Sonny” has been created to counter the central problem caused by the controlling supercomputer’s logical revocation of the Three Laws. If you miss this you can incorrectly see the movie just in terms of “mad computer attempts to take over the world with the aid of revolting robots” when there is actually more to it than that, which is discussed in the commentary regarding the meaning and significance of the final scenes of Sonny on the hill. This is where the movie differs somewhat from other recent movies concerning technology such as A.I., Minority Report, and Ghost in the Shell 2. There is not a lot of philosophical musing. Our hero (played brilliantly by Will Smith, in my opinion) is an anachronism and one of the few individuals left apparently who does not have implicit trust in robots and technology. He doesn’t spend a lot of time musing about the meaning of intelligence, free will, and what it means to be human. He’s trying to solve a murder. In the process he uncovers much more serious underlying issues, issues that he does not immediately recognize as significant. Nor do we, the viewer, see this on a first viewing. Studying the DVD shoes how sophisticated this movie really is. One disappointment: I would have liked to have seen more information about technical production details. While the evolution of the robot designs are shown, not a lot of information is provided about sets and cityscape. At times, for example, I simply could not tell what was real about a set and what wasn’t. This is particularly apparent in views inside buildings and aerial shots of future Chicago. I knew some things were obviously fake, but the boundaries were very very difficult to see. Quite impressive! Also, it is tempting to compare robot Sonny to Gollum. Some of the same techniques appear to have been used to create facial expression and body movement. As much as I like Sonny, I have to give Gollum the nod on this. A major reason is that Gollum is actually humanoid and Sonny is a mechanical device. Gollum is made more creepy by his humanoid/hobbit origins, whereas Sonny progenitors are faceless mechanical beings. But that is a quibble. This is a great movie, and a great DVD. That this movie doesn’t stay close to Asimov’s original stories is OK with me. I tried to re-read some of Asimov’s early stuff a while back and was greatly disappointed. Unlike the earlier works of, say, Clarke or Heinlein, Asimov’s story is badly written and, well, dusty. I admit the ideas are great, but the execution is mediocre. Asimov the writer can’t hold a candle to the writing skills of contemporary authors like Neil Stephenson, Vernor Vinge, or Greg Bear. I wanted to see I, ROBOT not because of Asimov but because of Alex Proyas, director of DARK CITY, THE CROW, and GARAGE DAYS. I figured that if someone was going to make a thoughtful popcorn movie, Proyas is the one. I was right. I thoroughly enjoyed this movie and not just because of the special effects. My interests were engaged despite the veneer of future-cop-against-evil-empire that permeates the film. The film’s sensibility owes more to SOYLENT GREEN than to MINORITY REPORT­­, even though the special effects are light years beyond the former. It’s good, I think, to have big movies that project the future in recognizable ways. I, ROBOT succeeds on that account because of the way it projects how technology increasingly permeates our lives and how, increasingly, we are dependent on a worker class for basic services and defense. I won’t give away plot details since this movie is so new. Fans of science fiction that describes what happens when we increasingly rely on technology will recognize a lot of what is shown in I, ROBOT. You don’t have to go too far to find other cinematic references to technological threats – 2001’s HAL, Metropolis’ robot, Terminator’s Skynet are just a few. The robots in Proyas’ film are, well, ubiquitous, carrying bags for their owners, walking down the street, hugging the kids they baby-sit, even cooking in Grandma’s apartment. They are as common as pets. But even pets can turn on their masters, three laws or not. And when they do revolt, the stuff really does hit the fan. Action sequences abound in this film. The end battle is a swirl of motion which, I think, will set the standard for climactic-fights-high-atop-a-precipice action. The mix of live action and digital effects in this is truly masterful. Also exceptional is the tunnel chase with its interplay of thundering trucks, sparks, and leaping robots. Finally, though, what is it about Will Smith and pies?